The ground underfoot changes suddenly from meadow to manicured grass. I have arrived at Henley-on-Thames. The sun is out and the riverside park is filled with afternoon activities. A short time to sit down and take in the atmosphere, and indulge in an ice cream from one of the convenient small cafes, and then I am off to the museum. Screened by a row of trees from the towpath is a modern building dedicated to one of our oldest competitive sports. 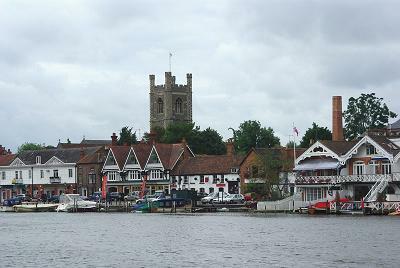 Henley is the home of English rowing, and the museum is dedicated to its history. 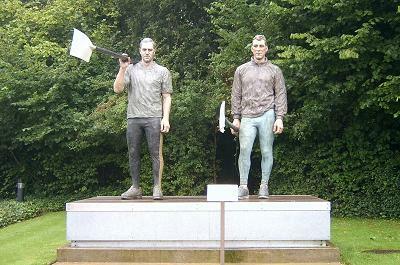 In the car park stands a pair of statues honouring the two most famous rowers these islands have produced. Sir Steve Redgrave and Matthew Pinsent are represented carrying their oars, walking towards the river for a hard days training session. The main gallery is packed with rowing memorabilia, telling the stories of the history of rowing from the early Greeks, through the Oxford – Cambridge Boat Race, the Henley Royal Regatta and finally to the great successes of the latest Olympic team. There are also three other galleries well worth a visit. Next to the rowing gallery is an exhibition of the geography of the Thames, starting at the source and finishing at the estuary. Another gallery provides a pictorial history of the town of Henley-upon-Thames, but the final gallery is a delight of its own. Take the children to The Wind in the Willows. If you don’t have children just go anyway and lose yourself in the world of Mr Toad and become a child yourself. Press the audiophone to your ear and meander lazily among the models while the classical story unfolds about you. Meet Mr Toad with his caravan, see his car, stand before the judge and hear the jail sentence. Follow his escape cunningly disguised as a washerwoman and then cheer on Badger and his friends as they drive the dastardly weasels and stoats from Toad Hall. Finally stand and witness a triumphant and gloating Toad at the end. Henley Bridge has a couple of interesting carvings on the centre of the Bridge. The bridge was designed in 1786 by William Hayward, but the carvings are by Mrs Damer, who was a relative of Horace Walpole. The mask facing upstream is of Isis, and that facing downstream represents Tamesis, or Old Father Thames. Why Isis should appear at Henley, a long way downstream of Oxford is not known. It would make more sense, and resolve a lot of arguments if these heads were at Dorchester, but we have to enjoy them where they are. The first ever boat race between Oxford and Cambridge took place at Henley on Wednesday June 10th 1829 at 8.10pm. Oxford were the winners, taking 14minutes and 30 seconds to row from Hambledon Lock upstream to Henley Bridge. Reports say that a crowd of 20,000 people turned up to watch. It all started when two school friends from Harrow School went to the different Universities to continue their studies. Charles Merrivale, who was at Cambridge, sent a challenge to his friend Charles Wordsworth (nephew of the famous daffodil poet) at Oxford. Wordsworth accepted the challenge and thus the first boat race between crews from Oxford and Cambridge was arranged. 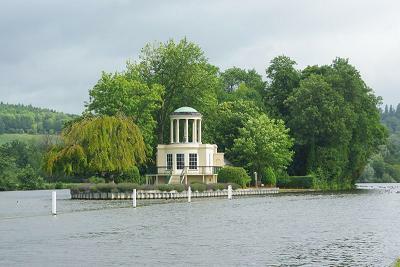 After suffering defeat Cambridge decided that Henley was not their lucky home, and the next time the challenge was issued the chosen venue was the Thames at Westminster, and the event has been staged in London ever since. Several other races were contested regularly along the reach and attracted good crowds of spectators and supporters. All of these people required refreshment and accommodation that brought money into the town. The good residents of Henley knew a good thing when they saw one, and on 26th March 1839 a public meeting was held at the Town Hall and Henley Regatta was born. The first event was held in 1939 and was so successful that two days were set aside for the following year. The regatta continued to grow in popularity, and in 1886 became a three day event, expanding into four days in 1906 and becoming the present five day extravaganza in 1986. Racing takes place from Wednesday to Sunday covering the first weekend in July. Prince Albert attended the event in 1851 and ever since that day the regatta has enjoyed royal patronage and been known as Henley Royal Regatta. The present rowing course is 1 mile and 550 yards (2,112m) long. All competitions are on a straight knock-out basis with the boats racing in pairs, one drawing the Berkshire bank and the other the Buckinghamshire bank. The main competition of the week is the Grand Challenge Cup which is awarded for men’s eights. This cup has been competed for at every regatta since it was founded. In 1908 and again in 1948 Henley was used for the rowing events at both of the previous Olympics that were held in London. All things must pass, and even the glory of Henley is now no match for the superb rowing facilities deemed to be essential for the modern Olympics. Some things don’t change, however, and the new hosts of the Olympics are even more well-to-do than this upmarket town. The next Olympic venue will be the Eton College rowing lake at Dorney. From Henley Bridge a distant object situated on the far bank has been constantly in view. Some unseen force seems to continually draw the eyes towards it, which was exactly the idea behind it. This is the Temple Folly, and was originally built in 1771 as a fishing lodge for the nearby Fawley Court. The Temple was designed by James Wyatt and the interior was inspired by the archaeological remains of ancient Pompeii in what is now known as the Etruscan style. 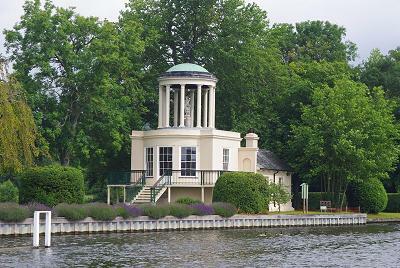 Temple Island was very conveniently situated for a starting point for the Henley Regatta, and it is from here that the races start. In Victorian times the Temple would be packed with revellers watching the regatta. Now it has been fully restored, and is available for functions. What an enchanting place for that special occasion.